Back in 2006 my article about Mahogany Opera's excellent production of Britten's Curlew River was followed by a discussion about operatic double-bills. 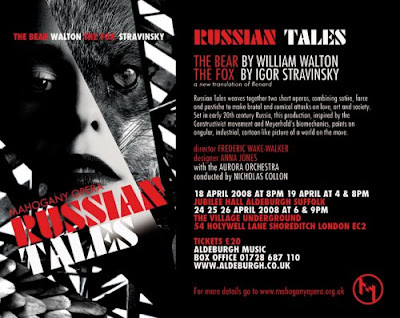 Nice to see it wasn't just an academic discussion, the company is presenting a double bill of Walton's The Bear and Stravinsky's The Fox at Aldeburgh and London in April. Also good to see the art of poster design isn't dead. More details here and another classical music poster boy here. I think a whole evening of Schoenberg might scare quite a few people off. I'd like to pair one of those Schoenbergs with a one-act Rossini... Best wishes, Frederic. Yikes! What kind of thinking equates that with a good idea? I loathe Rossini, so I'd leave after the Schoenberg (which they would do first, in that cynical way of programmers, because they know if they program it after the interval, most people would leave), and I seriously doubt there's many Rossinians who would stick around for the Schoenberg. The pieces wouldn't "illuminate" each other or "provide up new contexts" or somesuch program notes writer-speak, it would be a mess. I'm fully behind James Conlon's Recovered Voices project here in Los Angeles, but I wasn't happy that they broke up a natural double bill of Zemlinsky's one-act Wilde-based operas and subsituted the wonderfully lurid Eine Florentinische Tragodie (which was done in a semi-staged performance last year) with the utterly lightweight fluff of Ullman's The Broken Jug. I wish someone would do Korngold's wonderful double-bill that was written as such, Der Ring des Polykrates and the wonderful Violanta.